As you know Acrylic Albums are all the rave right now and Ms. Rae wanted to get in on the fun. 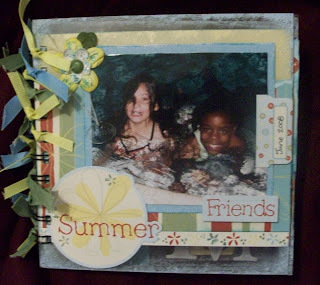 Using Close to My Hearts Life Delight's Level 2 Paper Pack and 6x6 acrylic pages, I completed a Summertime Fun album over the 4th of July weekend. I attended a wonderful 3 day event at a friends house in Victorville and this was one of the projects I accomplished. This fun book features my favorite little Divas Ms. Ericka and Ms.Mina. Aren't they Adorable? Watch this site for my upcoming workshop schedule for my classes on making a project like this. Thank for looking.